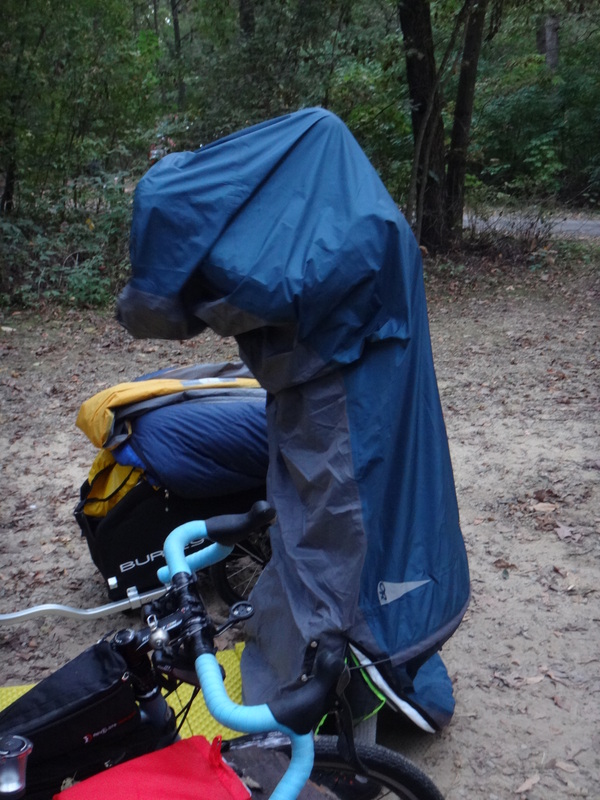 Despite my best intentions, there just hasn’t been much bike camping this year. There were plans for weekend tours, a week-long tour, and any number of other things. But they weren’t to be, for a variety of reasons (often lameness on my part though). Nate: You want to camp this weekend? Nate: Cool. But I have to do something after the coffee ride on Saturday. Me: That’s ok, we can leave later and go to Lake Kegonsa. So we went on the coffee ride as usual, then I went home to put the low-riders on the Troll while Nate went off to do what he needed to do. Then we met back up later in the afternoon, stopped for supplies, and rode the 13.5 miles to the park. After that: fire, wine, conversation, sleeping under the stars, fresh coffee in the morning, easy ride back to Madison, more coffee, brunch. Not even close to 24 hours. For anyone who might be interested in camping at Lake Kegonsa SP, I can’t say that we’d recommend it. The campground is crowded and much to close to Door Creek Road and the interstate, making it noisy. Most of the other campsites were filled with camper trailers; there are no walk-in sites. We went there solely because we were getting a late start and it’s the closest campground to where we live on the east side of Madison. And neither of us had camped there, for the same reason. Lesson learned. I hear ya. 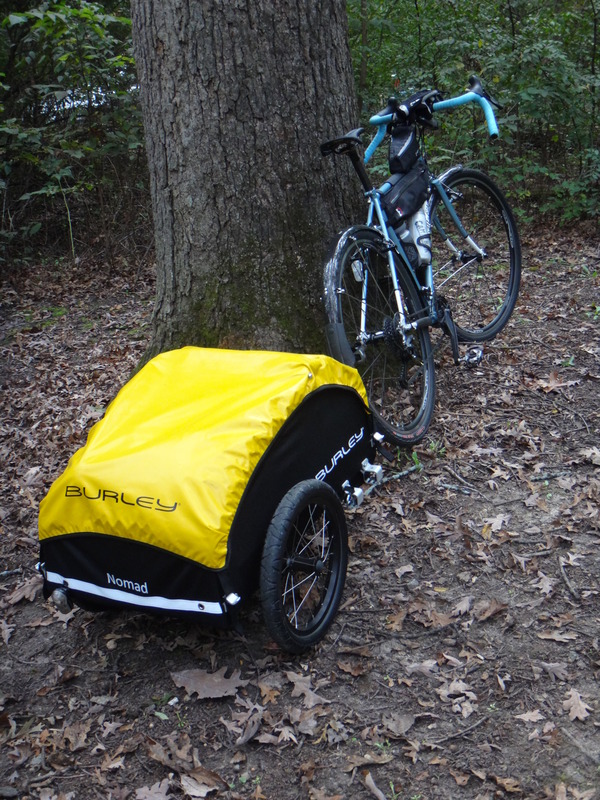 I wanted 2015 to be a big year of camping, and vowed to be part of the Bike Tour a Month club. It hasn’t happened that way. Summer was just too damn hot, and while relaxing at camp would be fun, there’s that whole riding through 95F heat to get there part. So I camped less this summer than I did in 2015. I still can camp this month, but probably won’t. Thankfully I live in an area that rarely gets super cold, so mid-winter camping is a possibility, and I’ve done it the past few years. As for your camping experience, it always seems like the campgrounds closest to cities are going to be like that, for good reason. A hiker/biker site or even “walk-in” site would definitely make it more bearable. I’m lucky that in Portland we have a few all-year campgrounds close by. One is only an hour ride from the end of the light rail, and it’s pretty quiet and secluded too! Well, have have a number of fairly good (for not being in the northwoods or the mountains) campgrounds, both at state and county parks) within a 40-75 mile ride each way. So, doable over the full day, though perhaps a little long in some cases when combined with elevation accumulation. But then I’d have to actually get out of the house before noon. Or 3pm. 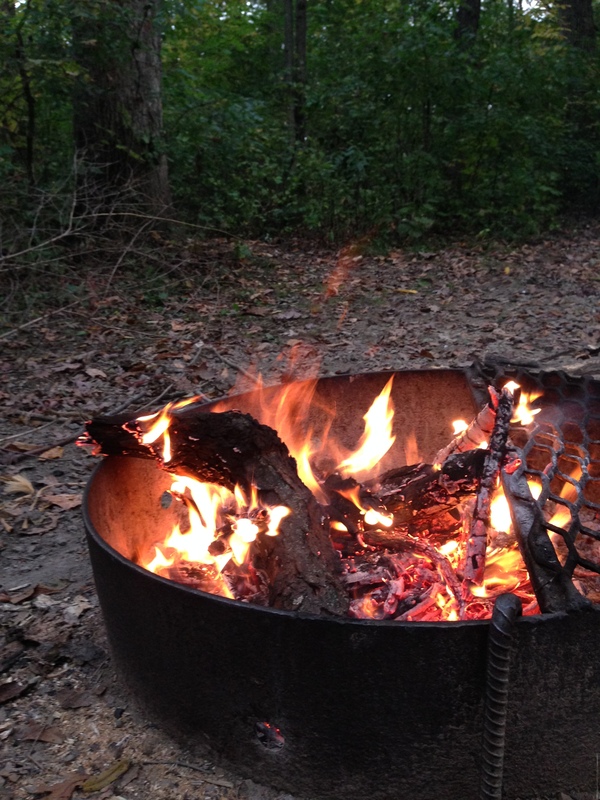 Either way, here’s to more camping in 2016. I think much of it is just habit. Not in the habit of getting up and going, or heading out after work, or getting the gear sorted out in time, or what have you. Funny you mention that, because I’m always the worst when it comes to packing. Now I’ve packed for a bike camping trip/bike tour MANY a time in my life (and spent 4 months touring across the continent) and all my gear is (mostly) in the same spot. Yet, it always feels like it takes FOREVER to get the damn bike ready! Then I hear about folks who can get the phonecall from a friend saying “let’s go camp tonight!” and they’re ready in like, fifteen minutes. I’d like to have that ability! I think my ability to get out the door on short notice is largely because I keep messing with my gear and baggage and bike setup. Every trip is different in that regard. 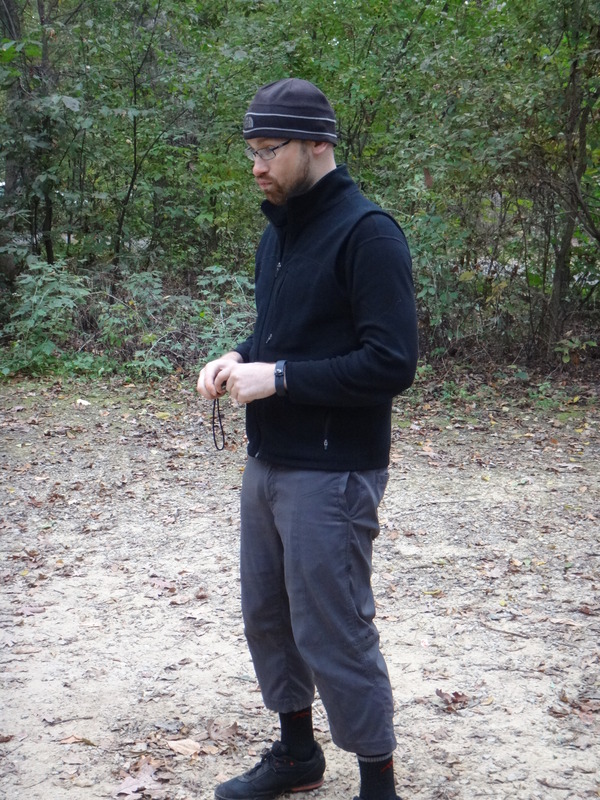 These days, I have about 80 percent of my camping gear for any given trip sorted out and in one place, ready to go at a moment’s notice. The problem comes with the other twenty percent, and how to carry it all on whatever bike I’m messing with at the time. But I’ve grown tired of the endless messing about, to some degree (it will never go away completely; I’m too much of a tinkerer for that). 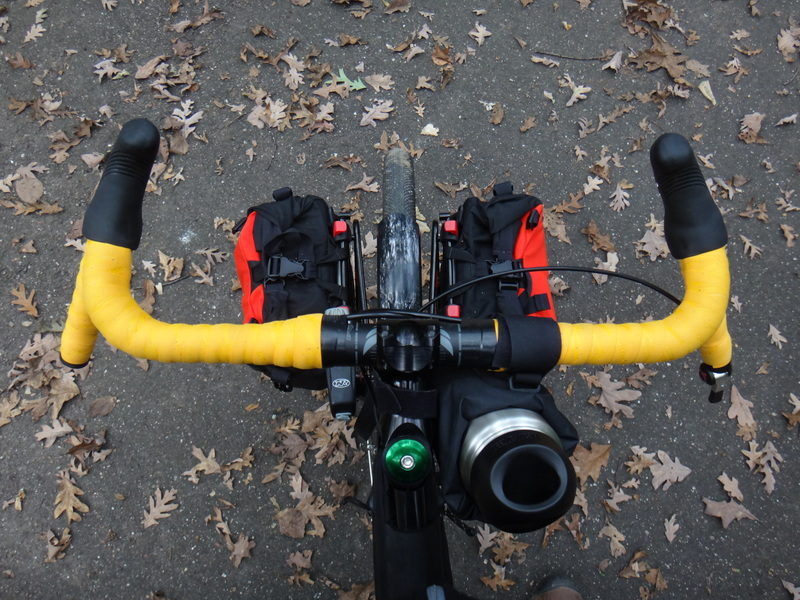 I’ve developed some very definite ideas about touring bikes and baggage over the years, most of which have settled into a recognizable structure. Now I just have to implement all of them together, in one rig. Something to do over the winter, I guess. Thankfully, now I only have one “real” camp/tour bike, and one way to set it up. 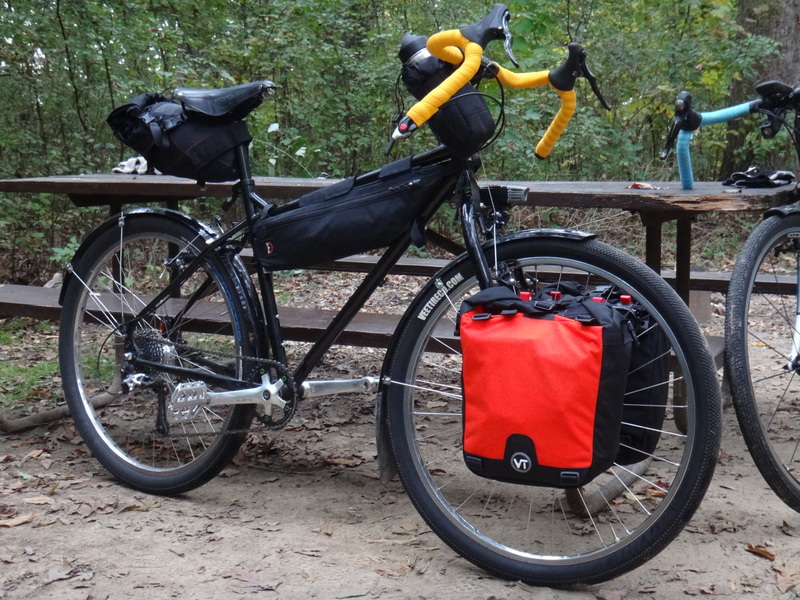 (I can camp with the Three Speed as well, but it’s not the “go-to” camp bike, for obvious reasons.) There’s the slight seasonal tweaks, like the need to bring warmer clothes and all that. The big thing for me is getting food ready, deciding what pre-packed stuff to take, getting the coffee, etc. That always takes more time than I feel like it should. That’s the direction I’m headed with the camp/tour setup. One bike, one set of bags used in incremental combinations depending on how much stuff I need to take. And at least my coffee setup is always ready to go: the most I have to do is make sure there’s alcohol for fuel and beans in the canister–but that’s the upshot of a weekly coffee-outside ride. Food always takes more time, though most of the places we go nearby are also so near towns that we rarely do much in the way of cooking in camp other than roasting things over the fire. Stop for supplies on the way in, stop for a cafe breakfast on the way out, if possible. Obviously, that doesn’t work for longer stuff in more remote areas…but then I’ve done precious little (read: none) of that lately. I’ve always been more of an eat at camp person, so I spend probably too much energy in figuring out food to bring. But I do love making pancakes at camp! As for coffee, my problem is I have too many different ways to make it, so I get hung up on that one. Oh, we mostly eat in camp too–but on short trips I don’t do a lot of actual cooking in camp. Grilling things, sure. Making coffee, definitely. 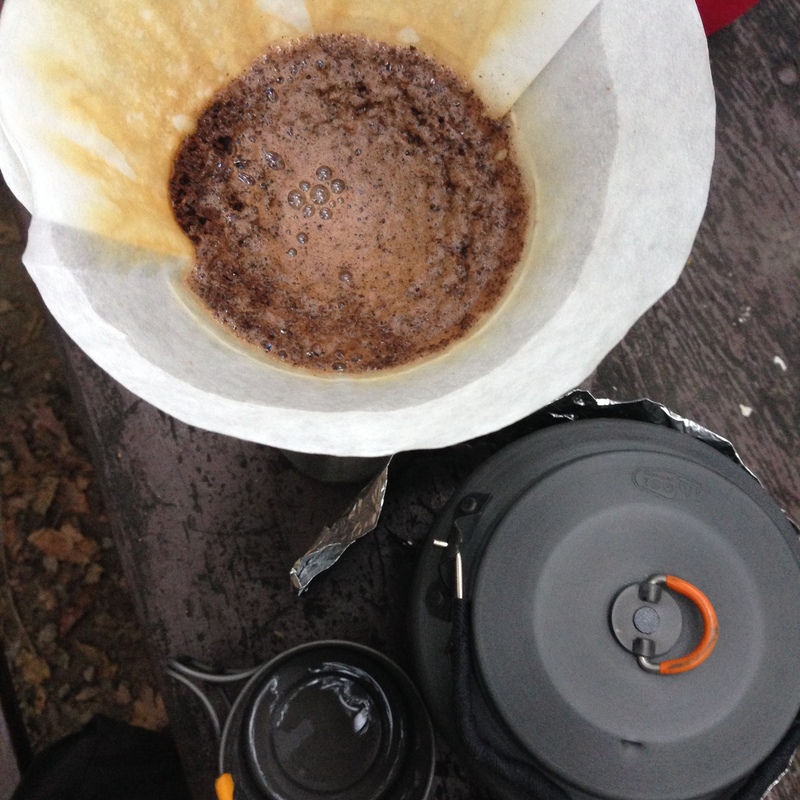 I too have about a half-dozen ways to make coffee, but when it comes down to it, pour-over is my default method. And also the one that packs the smallest. So I tend to go with that most of the time, which means it’s almost always ready.